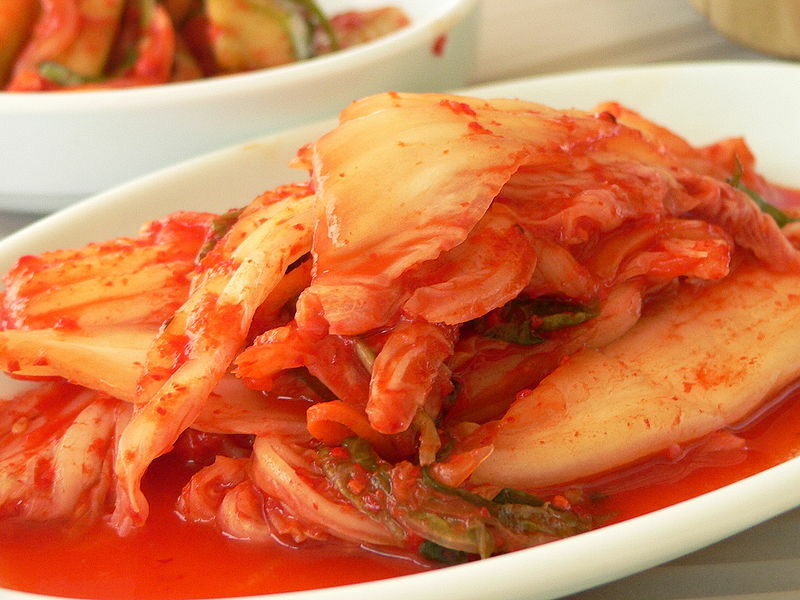 Kimchi, also spelled gimchi, kimchee, or kim chee, is any one of numerous traditional Korean pickled dishes made of vegetables with varied seasonings. Its most common manifestation is the spicy baechu (cabbage) variety. Kimchi is the most common banchan, or side dish, in South Korea and many South Korean communities and locales. Kimchi is also a common ingredient and combined with other ingredients to make dishes such as kimchi stew (kimchi jjigae) and kimchi fried rice (kimchi bokkeumbap). Kimchi is so ubiquitous that the Korea Aerospace Research Institute (KARI) developed space kimchi to accompany the first Korean astronaut to the Russian-manned space ship Soyuz. Early kimchi was made of cabbage and beef stock only, and in the twelfth century people began to include other spices to create different flavors, such as sweet and sour flavors, and colors such as white and orange. In modern times however, the main spice and source of 'heat' for most kimchi is a paste made from red chili peppers, a New World vegetable that would not have been found in Korea before European contact with the Americas. Consequently, red chili peppers were not added to kimchi recipes until some time after 1500. 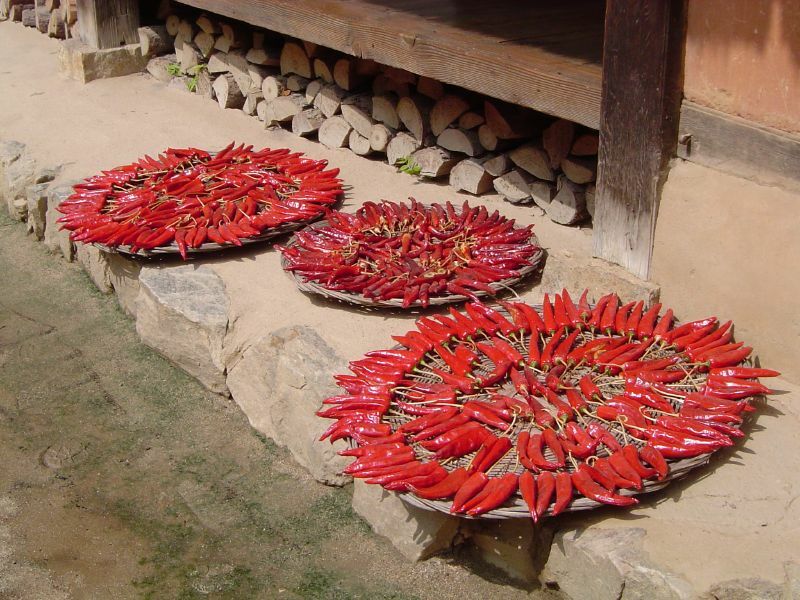 Left: Chili peppers drying for kimchi. Kimchi varieties are determined by the main vegetable ingredients and the mix of seasonings used to flavor the kimchi. The most popular type of kimchi is the baechu (also known as Chinese cabbage) variety but there are many regional and seasonal varieties. Popular variants include ggakdugi which is a kimchi made with cubed radish, pa-kimchi (made with scallions), chonggak-kimchi and oisobagi, a cucumber kimchi with hot and spicy seasoning. Kkaennip kimchi features layers of perilla and other spices. Although the most common seasonings include brine, scallions and seasonings, ingredients can be replaced or added depending on the type of kimchi being made. Common seasonings also include, ginger, onions, and aekjeot (fish sauce).